A snowman is a sign of winter! Whether you live in a place with lots of snow or no snow at all, you can craft snowmen all winter long. Display smiling snowmen in your home, do the project in a class, or on a snowy day. These crafts for kids include projects that are easy to make and mostly use household items. They'll keep your kids busy during the winter months and some are even cute enough to give as holiday gifts. Popsicle sticks are the perfect building blocks for kids' crafts and should be a crafting staple in your household. Stack them and glue them together before adding paint and some adorable felt details to make your own popsicle stick snowman. Introduce your kiddos to basic stitching with this easy tutorial that will result in an embroidered snowman flag. These flags are so adorable. If you are feeling crafty, make a bunch as a family and string them up as a banner across your mantel! In addition to being cute, the stitching is a thoughtful way to develop children's fine motor skills. This is a fun way for kids to send letters, thank you notes, or a simple hello to friends and family throughout the winter. 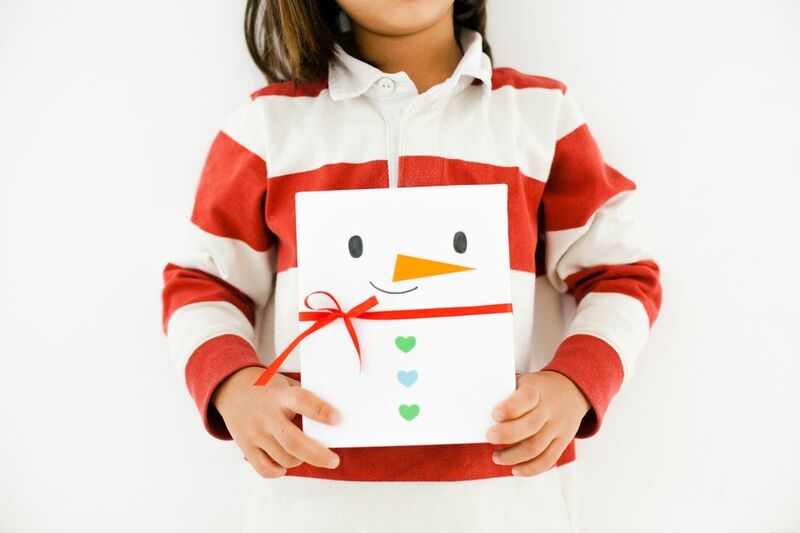 Decorate the envelopes with a cute smiling snowman. This is a great way to recycle all that junk mail and get the kids creating. Keep this craft in mind if a snowy day has you homebound and you run out of ideas! Encourage other friends to make these envelopes too. Mail your kids' letters and then you can have snow day pen pals. Save all the tissue paper from the holiday wrapping! When you need a craft, simply shred up tissue paper to make supplies for this tissue paper snowman craft for your kiddos! Add some silly googly eyes and pom poms for buttons and your snowman is complete. Get your kid’s creative juices flowing with this cute and fun snowman felt board! Once the board is made, the kids can decorate their snowmen however they like. This craft is cute enough to give to children as a gift. It's also perfect (and mess-free) for a long winter car ride. Save those paper towel and toilet paper rolls. They are crafting essentials. Make paper tube stamped snowmen for a silly winter kid’s craft! The creative possibilities are endless with this project. If you have a lot of thank you cards to write, use this stamp to make your own cute card from the kids. If you are short on ideas, try this simple snowman. Build a snowy snowman out of cotton balls, construction paper, and white cardstock! This craft is so much fun and easy to pull together for a last minute project on a snowy day. Watch the snow fall in this lovely snow globe snowman craft! Your kids will love crafting this darling idea and it will look adorable hanging up on the refrigerator (or somewhere special). Collect any orphan white socks and make this super sweet no-sew sock snowman. These socks make cute paperweights, door stops, or mantle displays. This craft is perfect if you are hosting a sit-down meal for a holiday party or winter birthday party. You'll arrange your plates and silverware to look like a jolly snowman in this cute table setting. With just a few simple details, your table will be festive and fun.